The Schoolhouse Crew recently reviewed See It and Say It Flip Flop Spanish from Flip Flop Learning. This multisensory Spanish program makes learning a foreign language easy and accessible even to people who have had no Spanish exposure. When you purchase See It and Say It Flip Flop Spanish, you receive two years of lesson plans, hole punched to be placed in a binder, three sets of full color flash cards, four audio CD’s and a white board “paddle” to write on. This program is fully scripted, meaning a non-Spanish speaker simply has to open up the teachers manual and follow along. The lessons are clearly details and tell you exactly what to do so there is no guess work. See It and Say It Flip Flop Spanish also comes with audio CD’s so you don’t even have to worry about knowing how to pronounce Spanish words before you start. You can work right along with your child to learn the words and pronunciation. The flash cards have full color images on one side, and if you flip them over, Spanish words on the other. These cards are used for the lessons, playing games and forming sentences in Spanish. They really turn the language into something that can be learned visually, which I think really helps children catch on that much quicker. This multisensory program looks just fabulous, and has been a huge hit with the Crew. 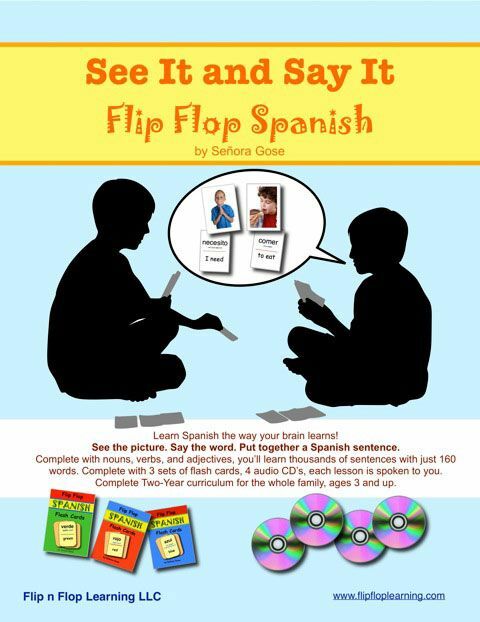 See It and Say It Flip Flop Spanish is intended for all students ages 3 and older, and retails for $99.95. Angie of Petra School used See It and Say It Flip Flop Spanish with her teens, and Sanz of From the Mrs. used the program with younger kids. Both bloggers enjoyed the program (and believe me, these women don’t beat around the bush!). I thought Lexi from Lextin Academy did a fantastic job showing how the program worked in her home on a day to day basis. This is a sponsored post from the Schoolhouse Review Crew and Flip Flop Learning. All opinions are my own, and I was not compensated in anyway. I didn’t know that! How cool!